As Councils, such as Bristol, are seeking to reduce their open spaces budgets by "recruiting" volunteers to help them, the Tetbury in Bloom team continues to maintain the flowerbeds and floral displays around the town. It never ceases to surprise me what difference a small, dedicated, group of individuals can make when they set their minds to it. Our work did not go unnoticed, with Tetbury featuring in the BBC2 Great British Garden Revival programme on 8th January: "pioneering our great British shrub revival" and transforming the town. Closer to home we received a lovely email out of the blue from a lady from Wotton Under Edge , congratulating us on the beautiful planting schemes and I quote: "Roundabouts, hanging baskets & other areas - spectacular!". And we continue to receive lovely comments from you the residents of the town. Thank you for your support. This year's Open Gardens event was perhaps the best yet, if over 200 visitors are the measure of success. There was something for everyone to enjoy and to take inspiration from: the clever use of topiary, to the colourful, well-stocked flowerbeds; formal mixed borders, to a more naturalistic planting style; unexpected gardens hidden totally from the view of the general public, to those gardens with a tantalising hint of their charms from the road. Thank you to everyone involved, to: Roy and Audrey Angell, Kate Corcoran, Nell and Malcolm Crawford, James Hudson and Lorraine Scrivens, Jo Parke, Alan and Julie Simcock, Christine Stevens, and Tony and Elizabeth Sykes for opening their beautiful gardens on our behalf; to the Womens' Institute for supplying the sumptuous cakes and for serving the refreshments; to Stephen Hirst for the delicious raffle prizes and to you, the visitors. For those of you keen to book your holidays around next year's event, do make a note of Sunday 28th June in your new diary, the fourth Sunday in June - more details closer to the time! The annual Race Night on 11th October was a lot of fun, raising valuable funds (for Tetbury in Bloom and Christmas in Tetbury). Thank you to Boho, Jesse Smith's Butchers, Moloh, Scentiments, Skeins, The Tetbury Tailor, Number 65 and Tetbury Hardware for sponsoring the races. Thank you to Tetbury Town Council, Tetbury Upton Parish Council, The Lions Club of Tetbury, the Feoffees, , The Rotary Club of the South Cotswolds, Saint Marys' Parochial Church Council, A.G Carrick, Pegasus Life and many individuals for their financial support. In October we were torn between great sadness and gratitude for many happy memories of one of our retired members, Doreen Simpson, when she passed away. From her wonderful enthusiasm to help create many of the flower beds, to her joyous and infectious laugh, we will certainly never forget her. This month we are now busy supporting the Christmas in Tetbury team by dressing the Christmas trees; arranging the closure of Church Street on 4th December for this year's Switch On event and stewarding the torch-lit procession that precedes it. You won't miss us because we will be wearing our striking high-visibility jackets! Gardening for Tetbury in Bloom is quite different to gardening at home. Of course we are looking for impact but, as in the case of the flowerbed on the roundabout, most people see it travelling past at fifteen miles per hour! 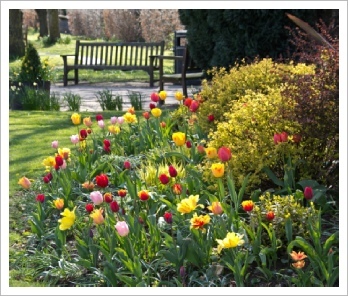 The flowerbeds in the Saint Marys’ churchyard need to be appropriate for wedding celebrations and the sombre occasion of funerals – this significantly affects our colour choice of plants. And, of course, all the floral displays need to be low maintenance because of the scale of the task the volunteers face. The key advantage, however, is that we work well as a team, we do have a lot of fun and morale is always high. Kniphofia “Tetbury torch”, a medium-sized, clump forming, deciduous perennial, with deep green, grass-like leaves and erect stems with green buds opening into apricot and yellow pokers. This plant is unusual in that it flowers repeatedly from late summer to early autumn. Penstemon, in shades from bright red and deep plum, to pale pink, with their tall majestic spires of flowers; penstemon flower from mid-summer right through to the first frosts of November and provide great value for money. Ornamental peony poppies, these annuals are readily grown from seed; even their distinctive seed heads add interest. Heuchera, providing superb ground cover, particularly when planted in groups, they come in a range of colours from lime green to deep purple, providing all year-round interest. Spiraea bushes, for their eye-catching beauty, fast growth rate, hardiness and ease of care. Phormium, for structure with their impressive strap-like leaves in a variety of colours. Choisya, a compact vivid golden leafed evergreen shrub, which produce fragrant white flowers in May and June for added interest. Box trees in various shapes, which give all-year round structure and a distinctive look to the many containers around town. Last month’s Race Night was another success. Thank you to everyone involved and particularly to Kevin Farnham for working the technology, Stephen Hirst for compèring the evening and the sponsors: Boho, Jessie Smiths Butchers, Moloh, Sentiments, Skeins, The Tetbury Tailor, Number 65 & Tetbury Hardware. I hope that you enjoyed the evening as much as we did. All money raised goes towards Tetbury in Bloom floral projects and the Christmas town lighting displays. The emergence of spring bulbs heralds the end of the dark winter and the promise of spring. 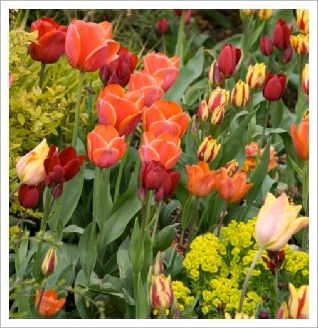 Crocus, daffodils and tulips bring a splash of colour to any garden. Also, planting tulips and daffodil bulbs in the herbaceous borders helps to fill in gaps and provide colour and interest before the perennials and shrubs begin to grow in early spring. If you want to fill your garden with colour next spring, plant bulbs from now to December, before the first frost, so that they have time to produce new roots before the onset of winter. At this time of year, Tetbury in Bloom is busy adding to its stocks of spring bulbs; this year it is the turn of the flowerbeds at The Knapp, the fire station, the library, Braybrooke and Tesco.
" Perestroyka - a large, lily-shaped bloom of red, orange, and raspberry flames with a sunny yellow base. " Attila Graffiti - a strong and vigorous tulip with burgundy petals with a purple "blush". " City Vancouver - pale primrose with a cream edge. " Night Club - an unusual, violet-pink multi-headed tulip. " Yellow Flight - a strikingly clear yellow bloom, this variety will provide added drama to the flowerbed outside the fire station. 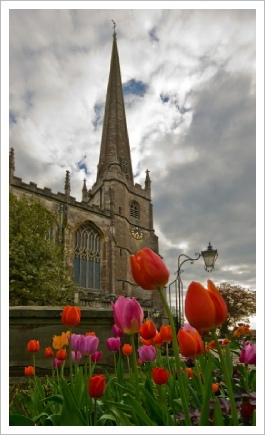 Remember to visit our website www.tetburyinbloom.org.uk regularly to keep track of the work of the Tetbury in Bloom team and our fundraising events. Look out for the details regarding the Tetbury in Bloom Race Night on 11th October - we look forward to seeing you there. September is generally a cooler, windier month than August and the days are noticeably shorter but there is still much to do in the garden and the work of Tetbury in Bloom continues. Throughout the summer months, the team have continued their regular twice weekly morning work parties, maintaining the displays for which Tetbury has become well known. Thank you to the team for all their hard work - didn't the floral displays look wonderful again this year? We have received many positive comments; thank you and do keep them coming, they make all the hard work worthwhile. Thank you to the Parochial Church Council for their kind donation towards the new Remembrance Garden in Saint Marys' churchyard. If you are clearing out your shed at the end of the season, may I request that you consider donating your old tools to Tetbury in Bloom - I am sure that we can find a home for them or sell them at Open Gardens Day next year to raise valuable funds. We are also planning ahead for the annual Race Night on Saturday 11th October at the Dolphins Hall. This is one of two major fund raising events in the year and critical for us to continue our work. Tickets cost £5 per person and are available from Sue Hirst on 504213. The price includes light refreshments. A bar will also be available. It is a great way to spend an evening and I do hope you will be able to join us. There is no Tetbury Advertiser published in August. Gardens are at their peak during the summer months, with striking colours, scents and relaxing spaces in which to enjoy the better weather. We continue to plant the summer bedding on Tuesday and Thursday evenings into July until all 33 flowerbeds and 46 troughs have been given their summer make-over. It is quite a task but hugely rewarding. Ivy-leafed and zonal pelargoniums, antirrhinums and begonias, in reds, pinks, oranges and magenta, together this year with yellow chrysanthemums, are just enough to provide that instant extra splash of colour throughout the summer. Antirrhinum (or snapdragon as we called them when I was a child) are frost-hardy reliable bedding plants that add height as well as colour to the middle of the flowerbed. They are a Tetbury in Bloom favourite. After planting, clip the top stem and any long side shoots to encourage the plant into a bushy, filled-out specimen. Last year we spent approximately £1,750 on summer plants alone; compost, fertiliser and the hanging basket were extra. Thank you to Tetbury Upton Parish Council for their contribution to the upkeep of the roundabout. Open Gardens Day on 22nd June was another big success, providing much needed funds, inspiration and a lovely afternoon out for so many people. Thank you to everyone who opened their marvellous gardens to the public: Roy and Audrey Angell, Kate Corcoran, Nell and Malcolm Crawford, James Hudson and Lorraine Scrivens, Jo Parke, Alan and Julie Simcock, Christine Stevens, Tony and Elizabeth Sykes. Thank you also to the Women's Institute for their help with the refreshments and for their delicious home-made cakes. Also thank you to Stephen Hirst for his cakes, which made excellent raffle prize; to the Tetbury Lions Club for the use of their gazebo and to Tetbury Town Council for loaning us the urn. Finally, in the midst of summer, with the flowerbeds and hanging baskets looking their best, we are also working with the Christmas in Tetbury committee to plan the Christmas lighting displays and celebrations. For more details, watch out for future articles. I do enjoy looking around other people's gardens for inspiration and the Tetbury Open Gardens Day is no exception, offering a rare opportunity to explore the secrets of private gardens not usually open to the public and converse with real gardening enthusiasts. Also, I find that you meet up with friends as you tour the town. We look forward to seeing you. Open Gardens Day 2014 is on Sunday 22nd June, between 2.00pm and 6.00pm - plenty of time to see all eight gardens and enjoy the refreshments, which will be served at The Old Rope Walk. On show are privately-owned gardens of all shapes and sizes - I am sure there will be something to inspire everyone.
" 19 Northlands Way - GL8 8YT - An object lesson in gardening a small space; sculptured plants create interest - and humour - throughout the year, with floral colour for added summer interest.
" 15 Northfield Road - GL8 8HD - Don't miss this garden, which offers a real country feel. It is a private, tranquil oasis, much loved and gently gardened. 2 Silver Street - GL8 8DH - Enjoy a serene slice of Tetbury, this garden runs down a long slope, passing from delightfully domestic by way of a terrace to the shrubbery beside the stream.
" 43 Silver Street - GL8 8DL - In perfect proportion with the tall Cotswold House, and tucked into the deep wall of the Wiltshire bridge, the contrasting foliage and colours of this sheltered, well planned garden will draw you to every corner.
" 5 The Old Rope Walk, Fox Hill - GL8 8XQ - A garden created from a quarry and a wild wood. Leave the superb borders via a rose arch and a wide gravelled path into the shady, carefully crafted woodland. Steps and paths beneath some of the most mature trees in Tetbury will take you up the hillside to the sunlit crown.
" Rockside, Newnton Road - GL8 8XA - A wide, sweeping slope takes you up to stunning views. This garden complements the transformed house, emerging from long time neglect and a bedrock base.
" Ludlow House - GL8 8ED - This garden has undergone significant work in recent years to wonderful effect, with almost every plant in the garden moved - some more than once. Don't miss the chance to see the results, and please don't think you can see all there iso see from the driveway!
" Close House, Close Gardens - GL8 8DU - Hidden away behind high walls, right in the heart of the Town, this secret garden is home to many mature shrubs and perennials, an established clear-water pond and fascinating statuary. Thank you to everyone who has agreed to open their marvellous gardens to the public: Roy and Audrey Angell, Kate Corcoran, Nell and Malcolm Crawford, James Hudson and Lorraine Scrivens, Jo Parke, Alan and Julie Simcock, Christine Stevens, Tony and Elizabeth Sykes. Thank you also to the Women's Institute for help with the refreshments and for the home-made cakes and to Stephen Hirst for his cakes, which made excellent raffle prizes. Also thank you to the Tetbury Lions Club for the use of their gazebo and Tetbury Town Council for loaning us the urn. Tickets cost £5 per person, which provides entry to all eight gardens - children accompanied by an adult are free. Advance tickets (complete with a map and details of all the participating gardens) can be obtained from Ange Morrissey on 505723 or from the Post Office. Alternatively, buy your ticket at the first garden you come to or at the stall opposite the Market Hall on the day. All funds raised will go towards "in Bloom" projects and town floral displays. Thank you to Highgrove Enterprises, Jenny Norden Interiors, Martin White Jewellers, The Lions of Tetbury, the Feoffees, Tetbury Town Council and many residents for their kind donations towards our work. May marks the transition from spring to summer, with most of the spring bulbs having come to an end and the summer flowers just starting to bloom. Best of all is the promise of warmer weather. The Green was possibly the centre of the Anglo-Saxon village in the time of Abbess Tetta. It is now home to the commemorative flowerbed for Diana, Princess of Wales. This flowerbed looks particularly beautiful at this time of year, with its dark-leaved, deep pink flowered heucheras, tulips and alliums. In 2000, when the bed was originally created, it was planted with just 37 white "Princess Diana" roses - one to commemorate each year of the Princess's life. The roses are now joined a variety of perennial plants. For example, last year, we added hardy fuchsias "Display" (a small, upright, deciduous shrub, with deep-green foliage and deep-pink flowers) and Hidcote lavenders (a bushy, dwarf evergreen shrub with narrow silvery-green leaves and deep violet flowers) to provide additional colour and year-round interest. With financial support from the Tetbury and District Civic Society, we have also replaced the badly weathered and illegible commemoration stone with a new bronze plaque. We hope that you like the results. Plans are well underway for the addition of summer bedding plants and the arrival of the summer hanging baskets next month. (Many thanks to everyone who ordered hanging baskets from us.) Weather permitting, they should arrive on Thursday 5th June; Sue Hirst will contact you nearer the time to arrange delivery. We are holding our fifth Open Gardens Day on Sunday 22nd June, between 2.00pm and 6.00pm. There will be several new gardens to visit this year. Do look out for the details in my next article, on posters around town, or check out our website: www.tetburyinbloom.org.uk. We are delighted to be working with the Parochial Church Council to create a garden of remembrance in Saint Marys’ churchyard, a place where loved ones can be remembered. This is our first new project for a while. We have been helping to maintain Saint Marys’ churchyard since 2008. It is a particular favourite with members of the Tetbury in Bloom team. The sympathetic, and somewhat understated makeover, has increased the biodiversity of the existing flora and fauna and created a peaceful place to visit and a beautiful location for weddings. By using darker shades of mauves and reds, the effect is also sufficiently sombre for funerals. The formal flowerbeds are planted with dark-leafed heuchera that complement the dark foliage of the trees and also the stone of the church. Height has been achieved by using evergreen penstemon in two varieties - Hidcote Pink and Garnet. Planted together, they form a sustainable backdrop for the spring and summer displays. Over a thousand tulips in a mixture of colours - red, scarlet, crimson, plum, violet, pink and orange - are in bloom from now to late May. The addition of antirrhinums and bedding geraniums provide additional colour from June to late September. Hundreds of snowdrops and cyclamen, planted under the plum trees, create a wonderful display from early February through March. The inspiration was the gardens of nearby Colesbourne Park, famous for its snowdrop collection interspersed with other spring flowers for added impact. Situated by the bell tower, the Memorial flowerbed - dedicated to two local sisters: Mary Barnard and Edith Horner - is planted with euonymus, box and heuchera due to its shady and very windy situation. To the rear of the church, a fern bed, which includes periwinkle, pulmonaria, lily of the valley and other shade tolerant plants, brings life and interest to a very dark and dank corner. Also a memorial bed has been created, which is planted with heucheras, ferns, euonymus, fuchsias, phlox and epimedium. Thank you to the Rotary Club of the South Cotswolds for their kind contribution to our work. We were also pleased to be able to show support Saint Marys’ church at its quiz on 1st March, and the Hospital Trust at its quiz earlier in the year! Our hanging baskets, which comprise easy to care for trailing begonias, are still available costing £30 each. They will be delivered to your door in early June. To reserve your hanging basket, please call Sue Hirst on 01666 504213. 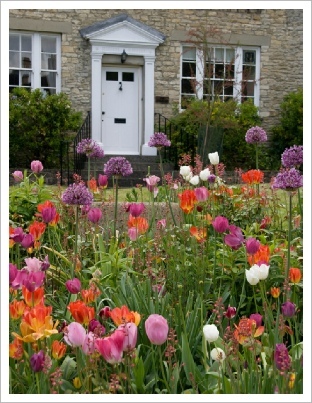 Finally, if you would be interested in opening your garden to the public on the afternoon of Sunday 22nd June in support of Tetbury in Bloom, please contact Ange Morrissey on 505723. We would be delighted to hear from you. For me the daffodil represents the iconic image of spring. 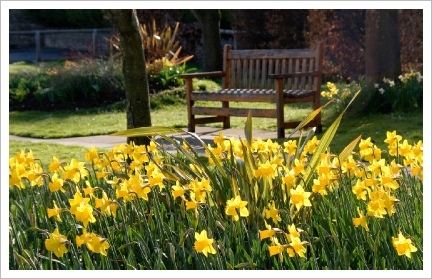 By March the promise of spring becomes a reality with daffodils standing tall and proud. Despite, and possibly because, last winter was long and drawn out, the daffodil displays around the town appeared to be never-ending. Let us hope for another beautiful display this spring but with warmer weather! Tetbury in Bloom has planted over one thousand "tete-a-tete" bulbs in the tubs and didn't they look a picture? This vigorous, dwarf variety, bears up to three flowers per bulb; it flowers between late February and April and is perfect planted en masse to lighten up dark areas or for growing in those areas not suited to larger daffodils. "Best Seller" is a sturdy and reliable "trumpet" daffodil, ideal for planting in large drifts, naturalising in the lawn, filling gaps in the border, or providing seasonal colour in a large pot. 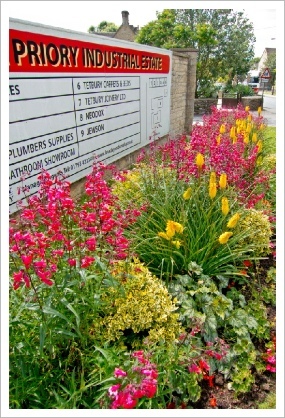 We have used them to good effect in the bank along the back of the long stay car park in West Street. The Tetbury in Bloom team is busy making plans for the year ahead. We are seeking volunteers to open their garden to the public on the afternoon of Sunday 22nd June. If you are interested, Ange Morrissey would be delighted to hear from you on 505723 and talk you through what is required. Later in the spring we will be in touch with those gardeners who have already expressed an interest - a big "thank you" to them. The Open Gardens Day offers a wonderful opportunity to explore gardens, big and small, not normally open to the public, to seek inspiration from real garden enthusiasts and to meet with them. It is a lovely afternoon out and another great event in the Tetbury calendar. We are also taking orders for our summer hanging baskets. They cost £30 each (the same price as last year). They will comprise easy care "Illuminations" trailing begonias in rose, light pink and apricot shades, which complement the Cotswold stone. They will be delivered to your door at the beginning of June; all you need to do is to install them, water them regularly and give them the occasional feed. To reserve your hanging basket, call Sue Hirst on 504213. Remember, all profits go towards funding Tetbury in Bloom projects. For more about the work of Tetbury in Bloom, watch out for the April edition of "Country Homes and Interiors" magazine (out this month). Spent over 1,000 volunteer hours ensuring that the floral displays continued to look their best. 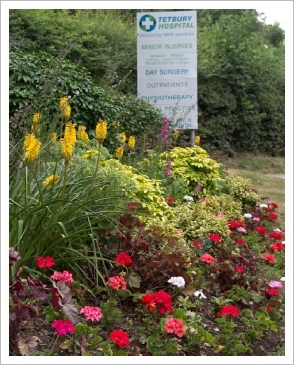 Maintained 33 flowerbeds and 42 troughs, in 15 different locations around the town. Planted 4,530 spring-flowering bulbs: crocus, daffodils and tulips, to supplement the 16,200 we have planted over the past six years. Planted 2,145 geraniums, 360 begonias and 450 antirrhinum to bring that extra splash of colour to the flowerbeds and tubs during the summer months. Installed 77 hanging baskets throughout the town. Held two main fund-raising events: the Open Gardens Day in June and Race Night in October 2013. Raised the £5,500 we needed to ensure the on-going viability of our work – to buy plants and materials. Our plans for the 2014 season are well advanced – more about them in future articles.